Picha takatifu ya karne ya 11 ya Theotokos Panachranta, yaani "Mama wa Mungu asiye na doa lolote". Kukingiwa dhambi ya asili ni fundisho rasmi la Kanisa Katoliki kuhusu Bikira Maria, kwamba alitungwa mimba bila kurithi dhambi ya asili. Alipewa na Mungu fadhili hiyo kwa kutanguliziwa stahili za Yesu Kristo, mwanae. Imani hiyo katika utakatifu usio na doa wa Maria ilishikwa na Wakristo tangu kale. Hata hivyo mjadala wa wanateolojia uliendelea muda mrefu kuhusu uwezekano wa fadhili hiyo kuhusiana na imani ya kwamba Mkombozi pekee wa binadamu wote ni Yesu. Kati ya watetezi wakuu wa fadhili hiyo walijitokeza Ndugu Wadogo, kuanzia Yohane Duns Skoto. Hatimaye dogma hiyo ilitangazwa mwaka 1854 kwa hati Ineffabilis Deus ya Papa Pius IX. Miaka minne baadaye huko Lurdi mtoto Bernadeta Soubirous alisema kuwa ametokewa mara kadha na mwanamke ambaye hatimaye alijitambulisha "Ndimi Kukingiwa Dhambi ya Asili". Kanisa la Kilatini linaadhimisha fumbo hilo kama sherehe tarehe 8 Desemba. Siku hiyo katika nchi mbalimbali ni sikukuu ya amri kwa Wakatoliki, na pengine sikukuu ya kitaifa. Sura ya 19 ya Qur'an (Sūratu Maryam) iliyonakiliwa kwa mkono katika karne ya 9, Uturuki. Mafundisho ya Uislamu juu ya ubora wa Bikira Mariamu yanafanana kiasi na imani hiyo. ↑ When defining the dogma in Ineffabilis Deus, Pope Pius IX explicitly affirmed that Mary was redeemed in a manner more sublime. He stated that Mary, rather than being cleansed after sin, was completely prevented from contracting Original Sin in view of the foreseen merits of Jesus Christ, the Savior of the human race. In Luke 1:47, Mary proclaims: "My spirit has rejoiced in God my Saviour." 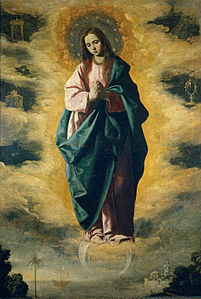 This is referred to as Mary's pre-redemption by Christ. Since the Second Council of Orange against semi-pelagianism, the Catholic Church has taught that even had man never sinned in the Garden of Eden and was sinless, he would still require God's grace to remain sinless. ↑ A feast of the Conception of the Most Holy and All Pure Mother of God was celebrated in Syria on 8 December perhaps as early as the 5th century. ↑ The papal bull defining the dogma, Ineffabilis Deus, mentioned in particular the patrististic interpretation of Genesis 3:15 as referring to a woman, Mary, who would be eternally at enmity with the evil serpent and completely triumphing over him. It said the Fathers saw foreshadowings of Mary's "wondrous abundance of divine gifts and original innocence" "in that ark of Noah, which was built by divine command and escaped entirely safe and sound from the common shipwreck of the whole world; in the ladder which Jacob saw reaching from the earth to heaven, by whose rungs the angels of God ascended and descended, and on whose top the Lord himself leaned: Genesis 28:12; in that bush which Moses saw in the holy place burning on all sides, which was not consumed or injured in any way but grew green and blossomed beautifully: Exodus 3:2; in that impregnable tower before the enemy, from which hung a thousand bucklers and all the armor of the strong: Song 4:4; in that garden enclosed on all sides, which cannot be violated or corrupted by any deceitful plots: Song 4:12; in that resplendent city of God, which has its foundations on the holy mountains: Psalm 87:1; in that most august temple of God, which, radiant with divine splendours, is full of the glory of God: Isaiah 6:1-4; and in very many other biblical types of this kind." The bull recounts that the Fathers interpreted the angel's address to Mary, "highly favoured one" or "full of grace" (Luke 1:28) as indicating that "she was never subject to the curse and was, together with her Son, the only partaker of perpetual benediction"; they "frequently compare her to Eve while yet a virgin, while yet innocence, while yet incorrupt, while not yet deceived by the deadly snares of the most treacherous serpent". ↑ Christianity: Immaculate Conception. BBC. Iliwekwa mnamo 25 May 2014. Je, unajua kitu kuhusu Kukingiwa dhambi ya asili kama historia yake, matokeo au athari zake? Ukurasa huu umebadilishwa kwa mara ya mwisho tarehe 21 Oktoba 2016, saa 10:33.